Nuziri and Daithni were Twi’lek twins, born on Hutta to a slave mother and unknown father. Their mother died shortly after childbirth and her Hutt master, having no interest in the cost of raising twins, literally dumped them in the trash. They were found by a kind hearted former Jedi who had left the order to marry his true love. They had a force-sensitive daughter named Ruce who was four years older than the twins and already skilled in the training her father had given her. As it turned out, Daithni was also force-sensitive and, despite Nuziri's lack of sensitivity, they both joined in on the training and advanced quickly to catch up with their older sister. 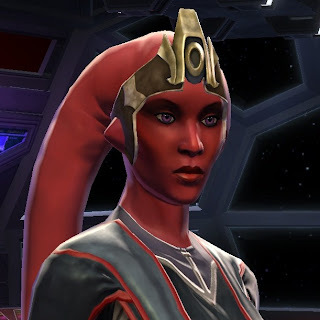 The force-sensitive children gained skills in lightsaber control and other offensive and defensive uses of the force, and Nuziri learned how to deal with and protect herself from force users. Their competitive nature quickly became apparent, and worse, Nuziri seemed to have a particular conniving malevolence about her that none of her parents’ love and understanding could counter. Daithni, while not as bad as her sister, showed definite leanings to the dark side and was easily influenced by Nuziri. Their competition with their “too good for her own good” older sister seemed to motivate further spiteful deeds from the twins. When the girls reached their teens, Ruce joined the Jedi Academy on Tython, but Nuziri refused to let Dathni go. Before she left, Ruce savoured one small moment of revenge against the twins: She told them that their adopted parents had lied about the nature of their mother’s life and death. They had not known that she was a slave to a brutal master. Angered that the truth had not been revealed sooner, Nuziri took Daithni and left the family they had grown up with. Nuziri immediately made plans to kill this Hutt, but not without significant preface. She got herself hired as a dancer at the Hutt’s casino and soon became involved in his stim trade. As needed, Nuziri would have Daithni stand in for her, allowing Nuziri to perform her covert plans and illicit operations. Nuziri successfully set up her own little smuggling business on the side and made arrangements for her sister to go to Korriban for Sith training. Though their bond remained, the distance between them helped free Daithni from her sister’s influence just enough. Daithni was still able to succeed in her training as a Sith, but she was no longer bound to her sisters angry desire to inflict pain on anyone and everyone. She could not justify acts of violence against the innocent and the downtrodden without cause. She often made decisions that would have resulted in failure and death on Korriban, but Daithni did share her sister’s skill at deception and was able to hide her occasional acts of kindness. Meanwhile, back on Hutta, Nuziri finally fulfilled her desire to kill the Hutt responsible for her mother’s death and destroy his legacy. He was a small Hutt within the Cartel, and Nuziri knew the Hutt’s presence would not be greatly missed. What she did not know was that her actions had been closely monitored by Imperial Intelligence – and by Darth Jadus of the Dark Council, who was also closely watching her sister….